Parliament sittings ended abruptly within five minutes after commencement yesterday morning due to lack of quorum of 20 MPs. The business of Parliament for yesterday and many committee meetings scheduled parallel to the sittings were postponed due to sudden adjournment of the House. The quorum of members was requested by UPFA MP Bandula Gunawardena after the presentations of papers and public petitions. Deputy Speaker Ananda Kumarasiri, who was at the Chair, ordered to ring the quorum bell to summon the members in, but only 17 MPs remained after the quorum bell rang for five minutes. Leader of the House and Minister Lakshman Kiriella at this point requested the consent of the House to proceed without considering the lack of quorum of MPs. “It is a waste of money and time. I request to continue despite the lack of quorum of MPs,” he said. The Deputy Speaker said he could not allow that request as it is a violation of the Standing Orders of Parliament. Then he announced that the sittings were adjourned till 10 am today. MPs Bandula Gunawardena and S. C. Muthukumarana were present in the chamber from the JO. Government members Gayantha Karunathilake, Lakshman Kiriella, Karunarathna Paranavithana, Ranjith Aluvihare, Shiyani Wijewickrema and Ananda Aluthgamage were present in the chamber while Eran Wickramaratne and Mayantha Dissanayake rushed in at the last minute of the quorum bell. JVP MPs Bimal Rathnayake, Nihal Galappatti and Dr, Nalinda Jayatissa and TNA MP Kaveendiran Kodishwaran, EPDP Leader Douglas Devananda were present in the Opposition benches. JVP MP Sunil Handunnetti and TNA MP Ganamuthu Srineshan entered the chamber after the sittings were adjourned. Some of these MPs had been attending various meetings including the COPE in the committee rooms in Parliament. Many UNP MPs were taking part in the UNP Anniversary Convention in Sirikotha yesterday morning. 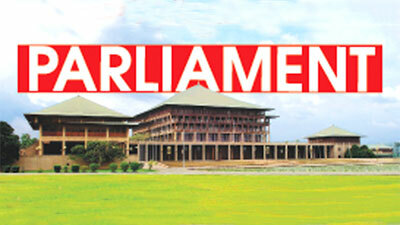 Speaker Karu Jayasuriya had previously stated that Parliament spends over Rs 4.5 million each day to conduct the sittings. The government will introduce a new law to recover damages for the death of a person caused by a wrongful act, omission, negligence or fault of another. According to the new Bill titled ‘Recovery of Damages for the Death of a Person’ gazetted on Monday, family members or a guardian of the deceased will have the right to “maintain any action for damages” against the person whose wrongful act, omission, negligence or fault caused the death of that person. Parents, children, siblings, grandparents or the guardian of the person whose death was caused due to the reasons given, have the right to apply for the recovery of damages for the loss of that person’s love, affection, care, companionship and for the pain and suffering caused. The Bill will be presented for first reading in Parliament shortly by Justice and Prison Reforms Minister Thalatha Athukorala. The Court can obtain the assistance of one or more experts to decide on any matter under this Act. Any applicant who has abandoned the deceased person will not be entitled to claim damages under this legislation.